Allen Bradley POINT I/O 2 Point Digital Output Module 1734-OB2 Cat. No. : 1734..
Allen Bradley POINT I/O 2 Point Digital Output Module 1734-OB2E Cat. No. : 173..
Allen Bradley POINT I/O 2 Point Digital Output Module 1734-OB2EP Cat. No.:.. Allen Bradley POINT I/O 4 Point Digital Output Module 1734-OB4 Cat. No. : 1734..
Allen Bradley POINT I/O 4 Point Digital Output Module 1734-OB4E Cat. No. : ..
Allen Bradley POINT I/O 8 Point Digital Output Module 1734-OB8 Cat. No. : 1734..
Allen Bradley POINT I/O 2 Point Digital Output Module 1734-OV2E Cat. No. : 173..
Allen Bradley POINT I/O 4 Point Digital Output Module 1734-OV4E Cat. No. : 173..
Allen Bradley POINT I/O 8 Point Digital Output Module 1734-OV8E Cat. No. : 173..
Allen Bradley POINT I/O 2 Point Digital Output Module 1734-OW2 Cat. No. : 1734..
Allen Bradley POINT I/O 4 Point Digital Output Module 1734-OW4 Cat. No. : 1734..
Allen Bradley POINT I/O 2 Point Output Module 1734-OX2 Cat. No. 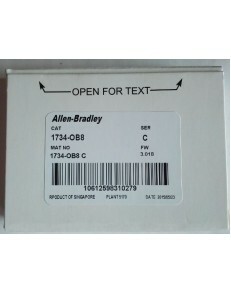 : ..
Allen Bradley POINT I/O Terminal Base 1734-TB ..